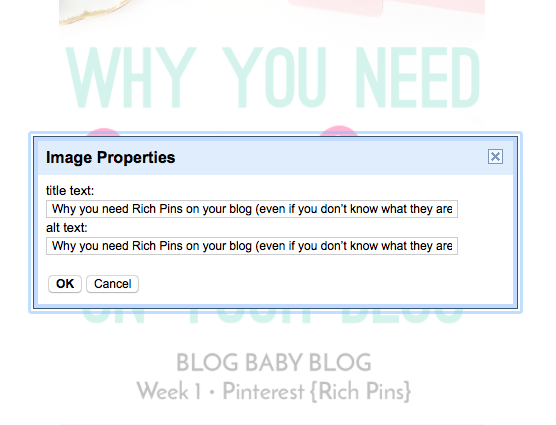 Blog Baby Blog Week 1: Make the Most of Your Rich Pins | I Teach. What's Your Superpower? Part 1: What the Heck are Rich Pins? If you followed the tutorial from Part 2 (or you were already on the ball), you have rich pins. You actually probably don’t have rich pins. You more likely have middle class pins and the potential for rich pins. The real richness comes from your ability to set the pin description. This is important for people to find your pin. What might they be searching for? Include those key words in your description. Unless you have been a very good, responsible blogger, you probably haven’t been using the description option on your images. 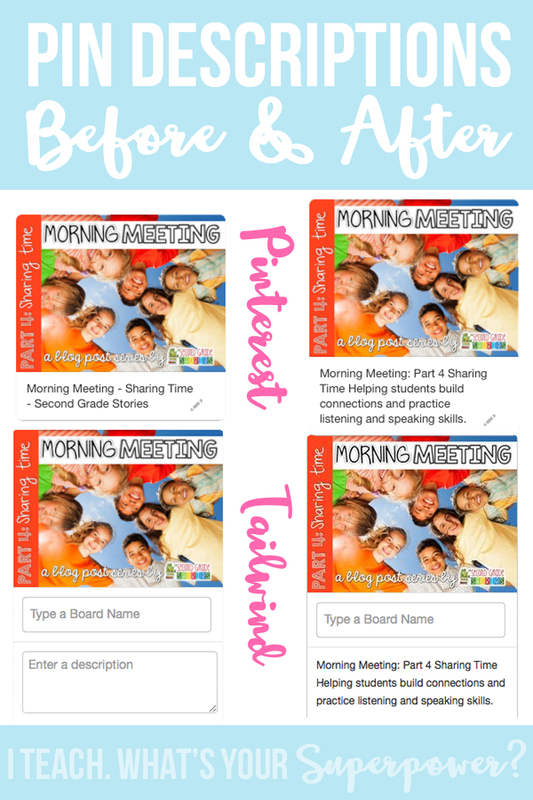 Pinterest will only pull the title of your post unless you do some extra work. When you insert an image, one of your options is to add an image description. Now that you have rich pins, Pinterest will pull the description you have added to an image. **To do this, click on your image-->Properties. Add the description to the boxes. Pinterest will pull from either box, but Tailwind pulls from the alt box. There are other sites that only pull from one or the other, so it’s best to add it to both. Give it a try. Go into an old post and add a description to one of the images and update the post. Now try to pin it. **FYI-This won’t change pins that are already on Pinterest, but will work on any pins pinned from your site in the future. Are you panicking a little on the possible hundreds of posts you didn’t add descriptions to? I was. I can’t fix all 247 posts unless I quit life. So, I’m not going to stress about it. I am going to work my way through my most popular posts and add descriptions to the images most likely to be pinned. At some point. Pinterest, like all social media sites, has a favorite size. This post says that (for now) Pinterest’s optimal size is 736X1104 pixels. I’m going to work on adding optimal images to those popular posts, also. Again, at some point. Any other tips for getting the most out of your images? 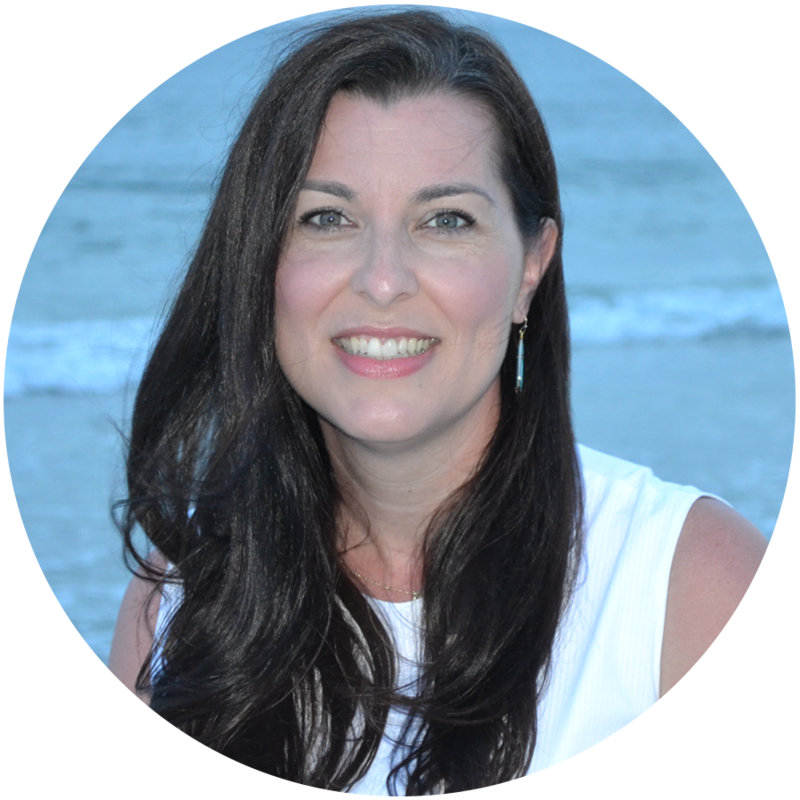 Thank you so much for your blogging posts! I've always enjoyed reading them, even if I already know the information. 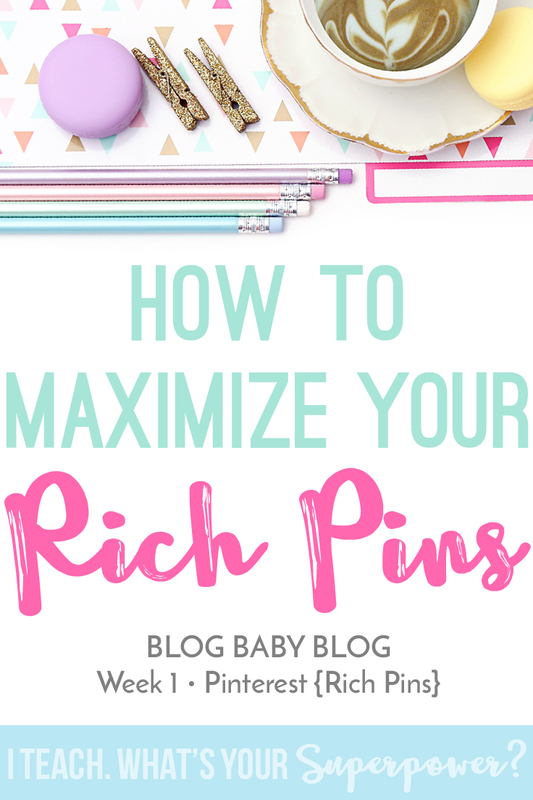 But this Rich Pins series has been completely new info for me! I greatly appreciate you sharing your knowledge with the rest of us. Thank you so much! Thanks Tiffany! It has definitely been new info for me. I can see how rich pins are making a big difference for people who utilize them. Now if only I could remember to add my images descriptions before I hit post. I keep having to go back and add them in! Megan this is such great information ! Thanks for putting it out :) I had no idea about rich pins . I will be trying to get through step 1 today . Wish me luck ! Hi Megan, this was super helpful! I followed all the steps and got validated, but my new pins still don't show my blog name at the top and a bold header, what am I doing wrong? for example: https://www.pinterest.com/pin/173177548151393344/ Thanks so much! !